Not to brag, but I used to make a ridiculously good lemon cheesecake. It contained over a cup of sugar and a pound of cream cheese which I’m fairly certain equated to at least a days worth of calories per slice, but it was totally worth it. Since starting the Specific Carbohydrate Diet I presumed my days of heavenly cheesecake were well behind me until I started to see raw cheesecake photos popping up on Pinterest. Although I doubted that ground nuts could really resemble silky cream cheese, my interest was piqued and I decided to give it a try. Smooth and creamy filling? Check! A tart lemon filling which is perfectly balanced with a sweet blueberry compote? Check! 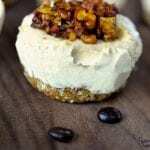 Not only do these raw cheesecakes taste better then regular cheesecake, they are healthier, have a prep time of less then 20 minutes and can be stored in your freezer for up to 3 weeks, meaning you can have a delicious dessert ready to go for those unexpected situations. An added bonus- my bragging rights remain in tact, I can still make a ridiculously good (and now healthy!) lemon cheesecake. Cut cling wrap into 5 x 5 inch squares and line each cup of a 12 cup muffin tin with a square (this will make the cheesecakes easier to remove once frozen). 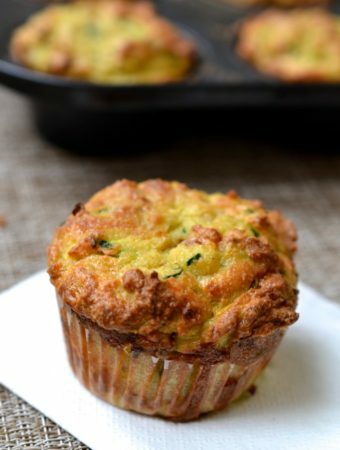 Place a heaping tablespoon of the base mixture into each muffin cup and press down with your fingers as hard as possible to create a compact and even base. Place the muffin tray in the freezer. 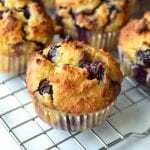 Remove the muffin tin from the freezer and fill each cup to the top with the filling. Place back in the freezer and allow to freeze completely through which should take a minimum of 4 hours. To make the sauce place the blueberries and honey in a sauce pan on medium heat and cook for 8-10 minutes until the blueberries are beginning to lose their shape and the sauce is bubbling. 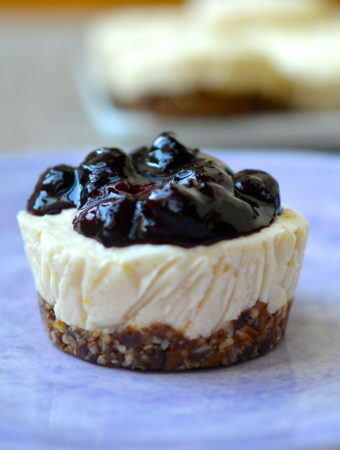 To serve, remove the cheesecakes from the tin, allow to thaw for 10 minutes or so and then top with the blueberry sauce. 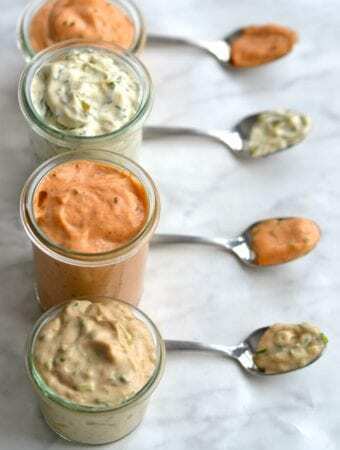 You can serve the sauce hot, room temperature or cold, it tastes fantastic any way. Enjoy! 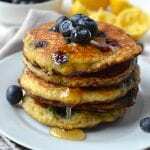 would the recipe still work if you didn’t add the the honey/maple? 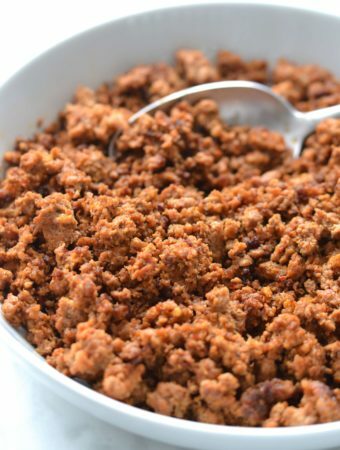 I am doing Whole30 and would like to make a dessert for valentines. (i am past my 30 dats, just living this lifestyle). 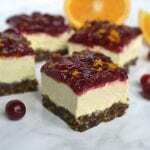 For people with a cashew allergy, would it work to substitute extra macadamia nuts in place of the cashews or would it be better to substitute cauliflower (like used in the Cranberry Cheesecake Bar recipe)? Yes you could definitely use all macadamia nuts in place of the cashews, it shouldn’t make a big difference in the end result. A favourite in our house. Even my fussy eater 6 yr old son wolf’s it down. I make it as one large cheesecake, and just keep in the refrigerator. Keeps for days (once 7 days). Very happy that I can give my kids a healthy dessert. Wow! I know how fussy a 6 year old can be so that is quite a compliment!! So happy to hear that your whole family loves the recipe! Is there another but I can substitute for cashews? I’m allergic to them but very excited to try these!! Are you ok with macadamia nuts? 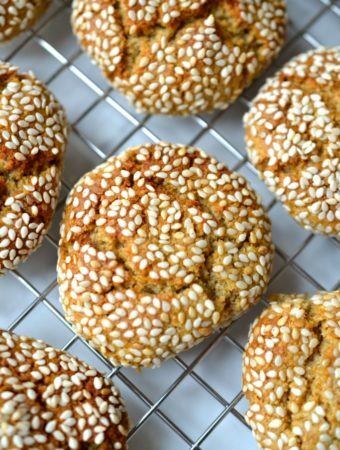 You could easily substitute those for the cashews and the texture and taste would turn out the same. I made this with a small tweak — instead of putting into muffins tins, I just put into a 9×9 square pan and then cut into squares before serving with sauce. I did one short cut which made me mega excited. Instead of soaking nuts overnight (didn’t have time), I put them in my instant pot with a bit of water (maybe half cup) and set to manual for 2 min and let the pressure rise naturally (instead of instant release). I combined both the the cashews and macadamia nuts for this step. This seemed to work very well. I have made cheese sauces and custards with nuts before, but this seemed to yield the creamiest texture to date. I am guessing soaking for long time would do the same. When they were finished in instant pot, they had soaked up most of the water and were bigger — and fork tender. Thanks Sonya!! I’m so happy to hear they were a success with the entire family! Thanks Mennie, I hope you enjoyed the cheesecake! 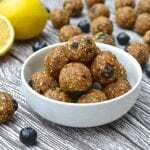 Unlike a lot of gluten free desserts this recipe contains only natural sugars so its a lot better for you. 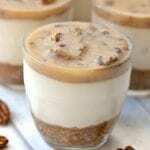 i want to try the cashew cheesecake. this looks delicious! who would have thought nuts would work as a substitute. 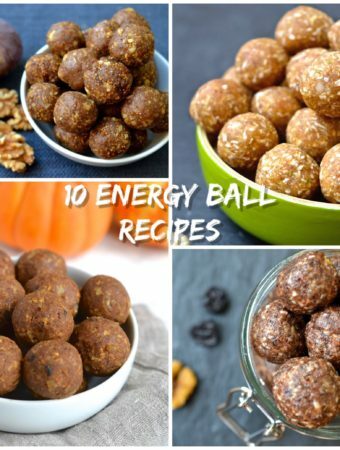 these look amazing, i will definitely be giving these a shot!